Come and See us in Thame! Home » News » Come and See us in Thame! 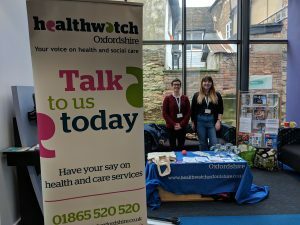 We’ve teamed up with Healthwatch Oxfordshire to gather your feedback on services in Thame. Earlier this week, we popped by Thame library to talk to people about their experiences of health and social care in Thame. Thank you to everyone who stopped and chatted to us. Though Thame is in Oxfordshire, it’s so close to the Bucks boarder, that some of the services are run by Bucks Health Care Trust instead of Oxford Health. Also, many of the residents may have used Bucks services like Stoke-Mandeville Hospital. That’s why, we’re working with Healthwatch Oxfordshire, so that no matter what service feedback is being given on, you can be sure it will end up in the right place. Come by for a chat and some freebies, or you can leave feedback on this site by visiting our homepage and finding the service you want to review. One comment on "Come and See us in Thame!" Impossible to find an NHS dentist who will take on new adult patients in Thame! Incredible considering how many dentists there are in the town centre.